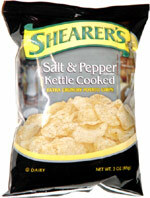 Taste test: These chips were thick, crisp and very crunchy, and they were packed with tons of great flavor. The flavor was not overly peppery in a way that would make you cough, but still very tasty. Instead of packing it with just pepper, they mixed in a combination of onion, garlic and other flavors that collaborated to give these an outstanding taste. Smell test: Wow, a really nice peppery smell. Made my mouth water!